Over the next month, we’ll be driving from Las Vegas to Boston and back, with many detours along the way. For the first several weeks, we’ll focus on visiting family, but the last week is all for us. We’ve decided to explore New Mexico. There’s so much to see there–cliff dwellings, famous pie, the National Solar Observatory, among many others. We’re really looking forward to it all. Since Abby was a toddler, we talked and joked about the possibility of her going to boarding school. It was always part possibility, part dream and part joke. That dream got a little more concrete in 5th grade when we began to wonder what effect home schooling would have on her chances of getting into a boarding school. I looked at several school websites and found cryptic notes about home schooled students needing to provide special information, but that information was never explained. I wanted to make sure the records I was keeping contained the information the schools would need. So, we contacted Paula Feldman, an educational consultant. One thing lead to another and before we knew it, we were driving to Corona del Mar to meet with Paula. She loved Abby and she opened our eyes to many of the possibilities that she had to choose from — that is when we got the idea to go to Switzerland for a year. We all got a little more excited about the prospects. A couple years passed and Abby began 7th grade and her first year in the Clark County School System. She did really well, but she was repeating alot of material she had already learned. Math and science, in particular, were way behind her skill level. In fact, she began spending her lunch period in her math teacher’s room to help that class to understand the concepts. In other classes, Abby got her work done so quickly that she was sometimes given the opportunity to actually teach a class here and there. In others, she sat and read, graded papers, did filing, and other assorted things to help the teacher. She was really bored. We were concerned because she was already in an advanced program and all advanced classes. Where could we go from there? We also began reading stories in the paper about the appalling test scores earned by high school kids in Clark County schools. They were the lowest in the nation and there wasn’t one high school that had better than an F. We got very concerned. We also began seeing more and more evidence of violence in our local schools. Abby came home with stories of fights and serious injuries inflicted on some of the kids in her school. We got even more concerned. So, we called Paula. It was already too late to get Abby into a boarding program for 8th grade and we were not even close to being ready to accept that anyway. However, she wanted Abby to have more academic experiences and she suggested Emma Willard’s summer program. Abby liked the idea of a writing course, so we signed her up. The day we dropped Abby off at Emma Willard, all three of us were in awe of the campus. It is stunning — with big gray brick buildings, buttresses, gargoyles, ornate architecture and ivy everywhere! The dorm rooms had beautiful molding, big windows with comfy window seats, and built-in closets and desks that looked like beautiful old-world furniture. As I walked around and met the staff, I could easily see Abby going to school there. It felt like a good match. That was the first time I began to think I could bear to let Abby go to boarding school, possibly even before 11th and 12th grades. Of course, Bob and I planned to move to wherever she went so she could come home on weekends with her friends. Every time we talked to Abby during her 2 weeks there, she was overflowing with enthusiasm for the school, the staff, the traditions, even the food! We already knew we didn’t want Abby to go to our local public school. Our friends reported that their kids had good experiences at Green Valley, but it would require a zone variance. Even Green Valley had lousy test scores. We also were very skeptical about our local private schools. Our experience with Sarah at Meadows was awful. Also, it’s 20 miles away. We would be driving with all the morning rush hour traffic. We decided to keep all our options open. That meant another call to Paula to get a list of boarding schools to visit. We flew East and visited/interviewed at 3 schools in 2 days. One was co-ed and we all disliked it. We didn’t even apply. The other 2 were all-girl schools — Emma Willard and Miss Porter’s. We loved them both and Abby was accepted to both. Both schools have structured their classrooms to enhance the learning opportunities for girls. For example, they have class rooms with no desks, only a big oval table that everyone sits around. The class sizes are small, usually only 8-12 students. Both were completely integrated with cutting edge technology — white boards in the classrooms, everyone required to have a lap top in class, wireless internet everywhere, etc. Mostly, we noticed the students. They were friendly, happy, active, excited, and loving life. They were healthy, well-fed, and it looked like they actually had on clean clothes!!! All the girls we talked to were enthusiastic about their schools and loved dorm life. Both schools have dorm parents who are johnny-on-the-spot for melt downs, teenage drama, illness, etc. They make sure the girls are well cared for. We also noticed the faculty. 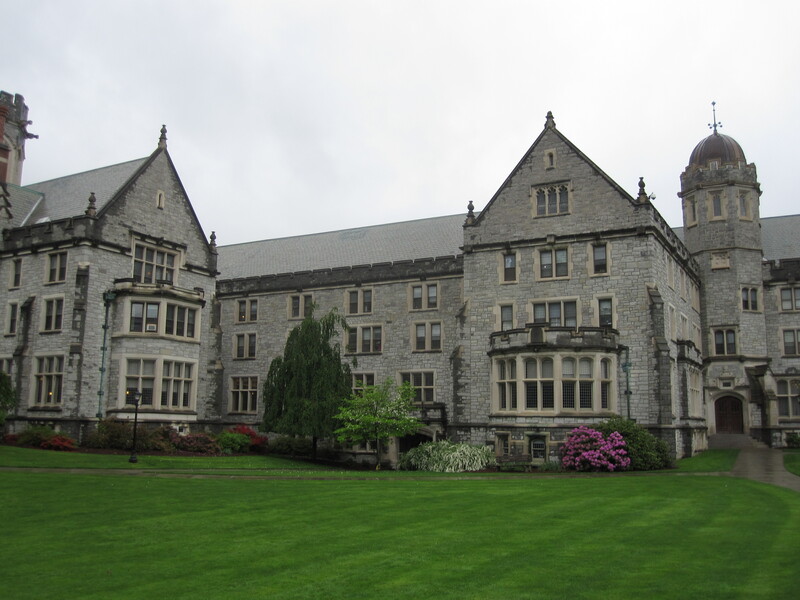 At Emma Willard, almost all the faculty have masters or doctorate degrees. Many have taught at the college level. The Physics teacher we talked to used to teach college kids, but prefers the girls at Emma Willard. He said they are sharper, more engaged, better behaved, and really interested in his class. He said he covers more material in a year with the girls at Emma Willard than he ever did on the college level. The girls just “get it.” We saw evidence of that in the classes we sat in on. They were full of discussion, debates, and questions. The girls were definitely engaged and well prepared for class. We also liked that almost all the faculty live on campus and are available in the evenings for extra help. They and their families also eat in the same dining room with the girls. There are required study hours every night and the faculty are proactive in pursuing girls they think may need extra help. They don’t wait for someone to fail before they jump in. We also liked the fact that because the classes are so small, the faculty can address each girl’s needs on a more or less individual basis. Emma Willard has several long breaks during the year that will allow Abby to come home. They get a full week at Thanksgiving, a month at Christmas, and 2 weeks for Spring break. There is also a parents’ weekend early in the year to meet all of Abby’s teachers, friends, and their parents. That is helpful should Abby want to go home with a friend for a weekend. I’d feel better about it if I knew the parents involved. Overall, Bob and I finally realized that we will live if Abby goes to boarding school. It is a fantastic opportunity and we know she will be challenged and will excel. We plan to get iphones for all of us so we can keep in close contact and text often. Abby has promised to let us know about her classes every day, just like she does now. We also plan to ichat regularly. I wish Bob and I could rent an apartment in Troy and live nearby, but in this economy, we just can’t do it. Throughout the entire process, Bob and I kicked around the idea of being dorm parents. We want to be near Abby, we can’t afford it. That would be a way to do it economically. In addition, it would help alot with tuition. We will see! Overall, the decision to send Abby to boarding school has been years in the making. As parents, our thinking on the topic has ranged from “no way” to “yes” and back again several times. 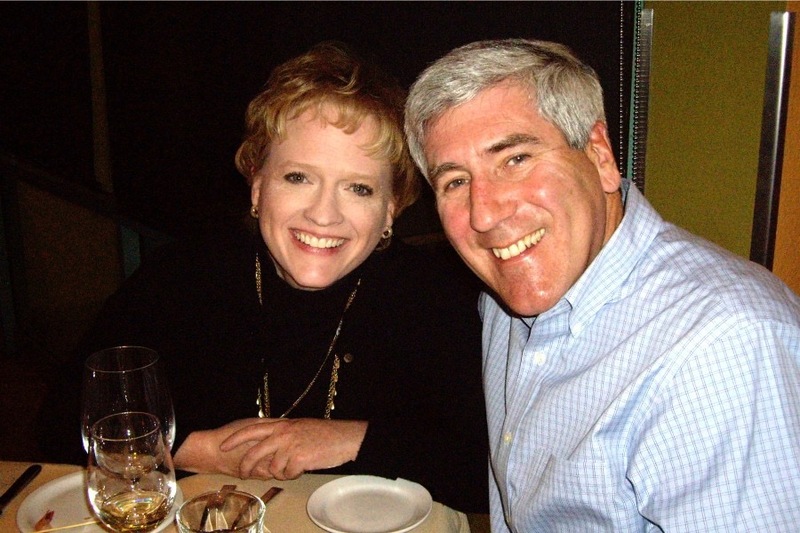 Very gradually (and with alot of prodding from Paula), Bob and I have come to realize that it really is the right thing. What we want has to come second to what is best for Abby. So much has happened since I posted about our decision to send Abby to Emma. 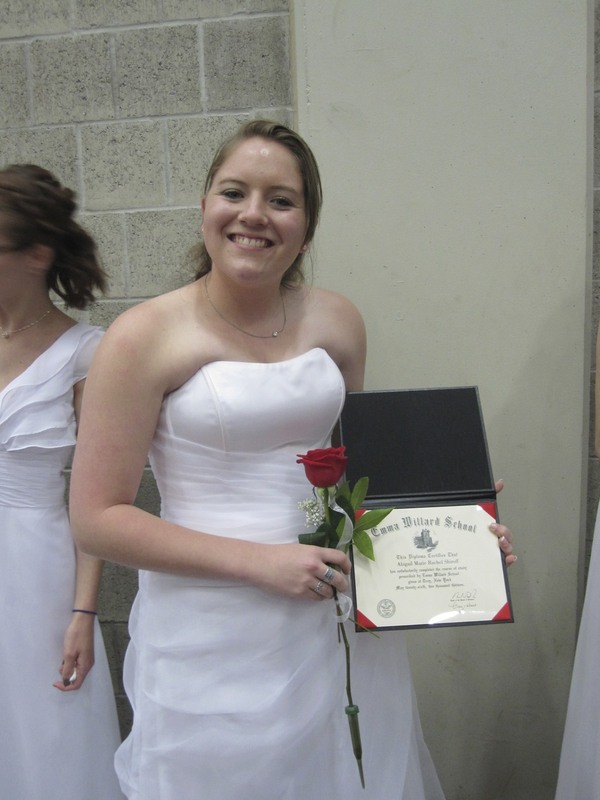 She attended Emma for four years, graduating in 2013. While at Emma, she had many ups and downs, as all high school-aged kids do. There were things about Emma I loved, especially the challenging academics and the close-knit community. There were also things I hated, like the idiot nurse who refused to send our daughter to a doctor on several occasions and required our direct intervention to get medical issues taken care of. Also, we hated not being there, especially for the low points when I wanted to hug Abby so badly my arms ached. We never did pursue becoming house parents. Our daughter is a very independent young woman and she wasn’t thrilled by the idea. Overall, Emma was the right decision for us. Abby learned so much–both in class and out. She had so many good friends and she grew close to several faculty members and their families. She still keeps in touch with many of them. She’s continuing her education at Boston University where she’s studying biology. If you are thinking of sending a child to boarding school, and Emma in particular, I’d be happy to discuss it with you. Please send me an email at ashiroff@me.com, and I’ll be happy to share our experiences. Some were good, some weren’t, but I’ll share them all so you can make the right decision for your family.